Professor Boulier received his BA in economics from North Carolina State University, and his MA and PhD from Princeton University. Before coming to The George Washington University, he was assistant professor in the Department of Economics at Princeton and research associate at the Office of Population Research. He has also been a visiting associate professor in the School of Economics at the University of the Philippines. 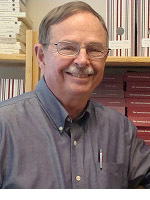 Boulier teaches courses in demography, microeconomic theory, and the economics of human resources. His research interests include demography, the economics of human resources, and forecasting. His current research includes: "Testing for Media Bias: The Market for Sports News" (with ChiUng Song and Herman Stekler) and "A Shot in the Dark: Uncertainty and Vaccine Demand and Supply". Selected articles include: "Estimating Parameters of the 1981-19 Influenza Epidemic on U.S. Military Bases", with Kyonsei Sohn, Journal of Applied Business and Economics, 2012; "Evaluating NFL Draft Choices: The Passing Game", with H.O. Stekler, J. Coburn, and T. Rankins, International Journal of Forecasting, 2009; "Measuring Consensus in Binary Forecasts: NFL Game Predictions," with Chiung Song and H.O. Stekler, International Journal of Forecasting, 2009; "Vaccination Externalities," with T.S. Datta and R. Goldfarb, The B.E. Journal of Economic Analysis and Policy (Contributions), 2007.